The new Memmo Alfama hotel in Lisbon is like Ali Baba’s cave. It is located off the beaten path, on a secluded alley in the ancient Alfama neighborhood. And from the simple exterior, it is impossible to guess what’s inside. When the doors open, you find an elegant space, decorated with great attention to detail. But the real surprise is the spacious terrace with an astonishing view of Lisbon. The Tagus river, the pantheon, the roofs of Alfama, all these treasures are there for the taking. 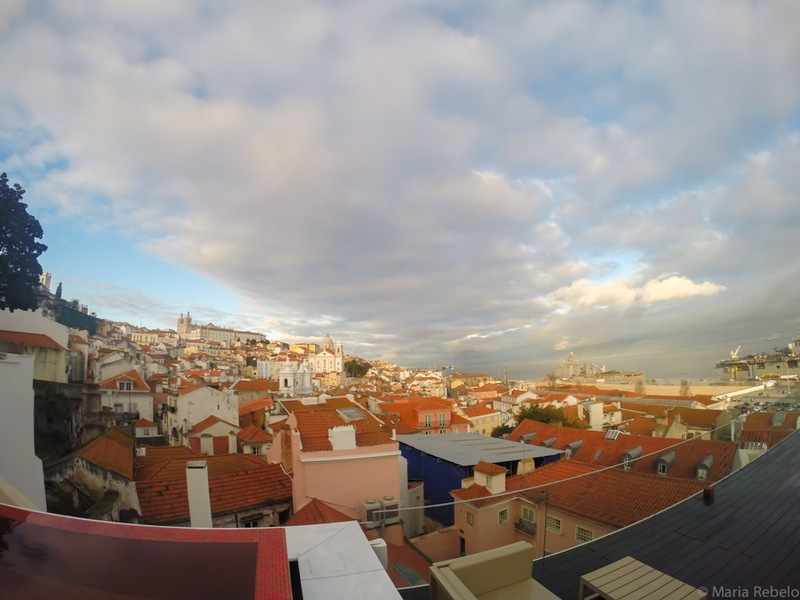 Memmo Alfama is at Travessa das Merceeiras, 27, Lisbon, tel 210 495 660, email alfama@memmohotels.com. Click here for the hotel’s web site. If you’re tired of boring, conventional hotels, the Hotel da Estrela might be just the place for you. 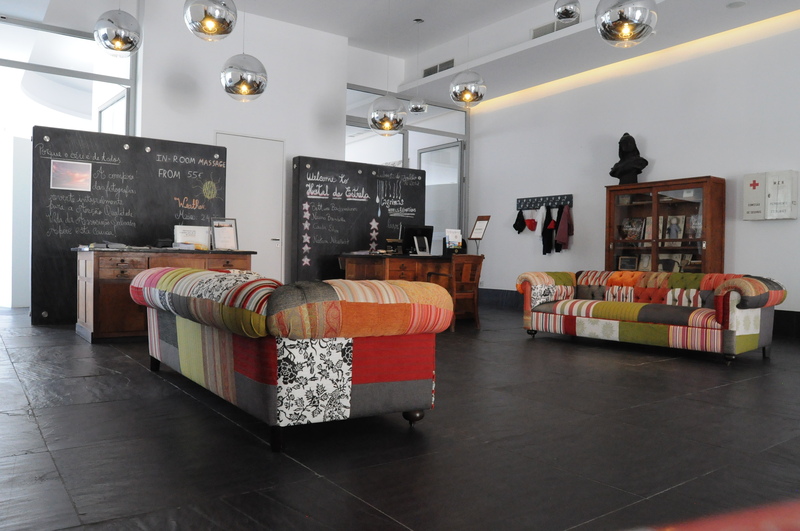 It is a former school transformed into a bohemian boutique hotel with a great vibe and lots of charm. The hotel is located in the quiet Campo de Ourique neighborhood. But, when you’re ready for sight seeing, all you have to do is board the famous tram 28 which will take you to Rossio, Chiado, or St. Jorge’s castle. Choosing where to eat when you come back is easy. Around the corner, you have a great restaurant run by chef Vitor Sobral called Tasca da Esquina, (which makes sense, since “esquina” means corner). But choosing where to have dessert is a more complex issue. The hotel serves a wonderful “pão de ló,” sugar, eggs and flour transformed into pure bliss. Nearby, you have Pastelaria Aloma, which won the prize for the best “pastel de nata” in Lisbon two years in a row. And then there’s a tiny store that serves the world’s best chocolate cake! The hotel has a nice garden where you can eat a picnic prepared by the hotel’s restaurant. It’s the perfect place to woo someone you love. If you need inspiration for what to say, just visit the nearby house where the great poet Fernando Pessoa lived. It works every time! 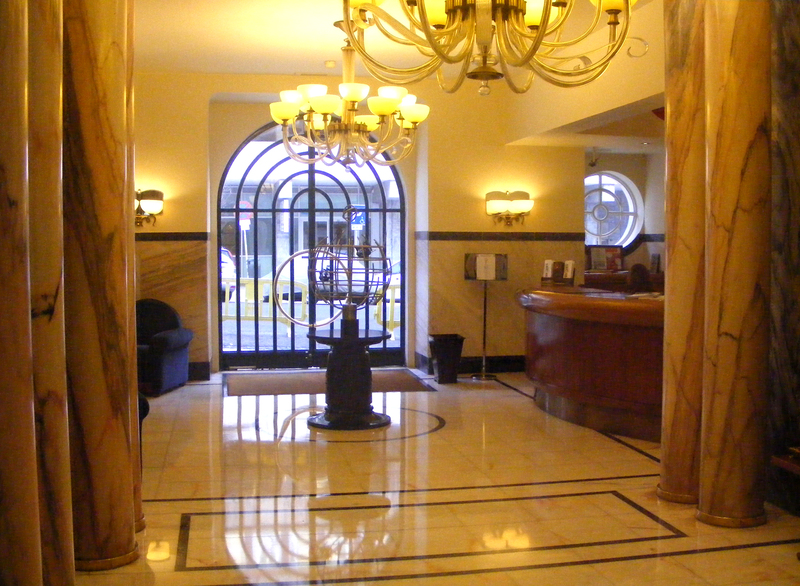 The Hotel da Estrela is located on Rua Saraiva de Carvalho 35, Lisbon, tel. 211 900 10; click here for the hotel’s web site. Click here and here for more information on Tasca da Esquina and Cervejaria da Esquina, respectively. For information on the life-changing best chocolate cake in the world click here. Pastelaria Aloma is on Rua Francisco Metrass 67, Lisbon, tel. 213 963 797. The Fernando Pessoa house is on Rua Coelho da Rocha, 16, Lisbon. Click here for their web site. 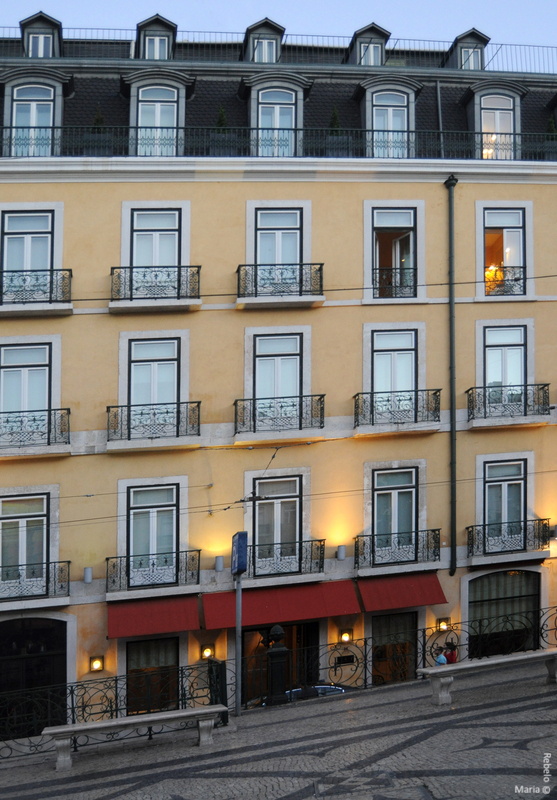 In 2005, the 18th century Hotel d’Europe was transformed into the Hotel do Bairro Alto. The result is a unique combination of aristocratic charm, modern comfort and superb location. After checking in, you can relax on the top floor terrace and enjoy the fantastic view of the Tagus river. Once you walk out, ready to explore the city, you’re seconds away from Lisbon’s most famous café, A Brasileira, and two minutes from Santini‘s fabulous artisan gelato. You can shop for porcelain to your heart’s content at Vista Alegre or choose beautiful cutlery at Cutipol. You can walk to Bairro Alto, enjoy the view of St. Jorge’s castle, stop for a drink at the port-wine institute, listen to some fado, and check out the avant-garde scene at Galeria Zé dos Bois. Or you can go downtown to stroll on Rossio and Terreiro do Paço. Where else in the world, dear reader, can you find so much fun on your doorstep? Hotel do Bairro Alto, Praça Luís de Camões 2, Lisbon, tel. 213 408 288, email: reservations@bairroaltohotel.com. Click here for the hotel’s website. In the 1940s, it was impossible to find an hotel room in Lisbon. Aristocrats, businessmen, smugglers, and spies of all stripes filled the luxury hotels. They also crowded the gambling tables in Casino Estoril, the place where Ian Fleming, a young British intelligence officer, found the inspiration for the first James Bond novel, Casino Royale. Most of the hotels popular in the 1940s have been renovated beyond recognition. One exception is the beautiful Hotel Britania, which was recently restored to its original elegance and understated glamour. Built in 1944, it was designed by architect Cassiano Branco in an art deco style. Located on a quiet street, it is the kind of place where Ingrid Bergman could have mended her broken heart, and where martinis are served shaken, not stirred. Click here for Hotel Britania’s web site. To stay in this 15th century palace in Alfama, the ancient neighborhood around St. Jorge’s Castle, you first have to find it. Despite its bright red doors, this small luxury hotel is so discrete that no one knows where it is. The palace, one of the few to survive the 1755 earthquake, incorporates castle walls that go back to Roman and Moorish times. It was at one point the residence of Pedro Álvares Cabral, the navigator who discovered Brazil. Five centuries later, the German director Wim Wenders used it in his movie The Lisbon Story. Sostiene Pereira, a movie with Marcello Mastroianni, was also shot here. In 1994 the French entrepreneur Frédérique Coustols saw the palace in disrepair during a stroll in Alfama. He bought it and restored it with impeccable sensitivity and taste. When you stay at Palácio Belmonte, you feel like royalty. Siting in the terrace in the late afternoon, drinking chilled white port and enjoying the stunning views of Lisbon, you quickly realize that it is good to be king. Palácio Belmonte, Páteo Dom Fradique, 14, Lisboa, Tel: 21 881 66 00, e-mail: office@palaciobelmonte.com. Click here for the palace’s website.